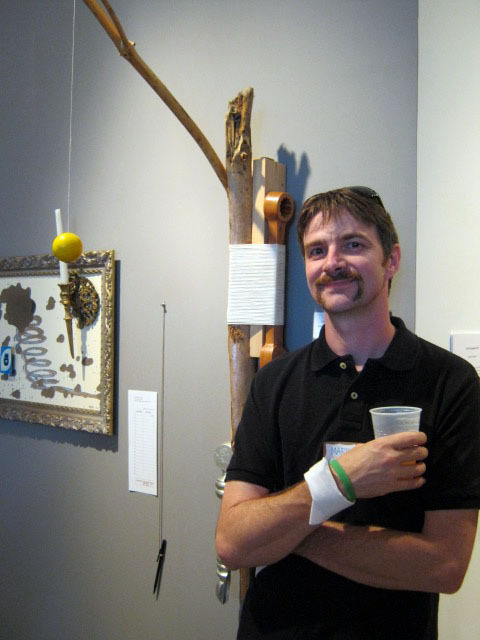 1. how i got involved in project reclamation: matt dehaemers is the reason i'm involved. matt contacted me early on because he knew that i grew up around and in joplin. i went to school through high school in carl junction, and spent a few years at missouri southern before transferring to the university of kansas in 1995. i'm a big fan of matt, the artist and the person, and i would probably have a hard time ever saying no to him. 2. the most striking and unexpected thing i noticed about viewing the installation was my tendency to look for and find objects that i could see in my own home. creating a personal connection with an object makes it easier to grasp the gravity of the event. being from the joplin area, i know several people directly effected by the storm. 3. the debris that i chose, i picked because it was material that might show up in my work anyway. chunks of 2x4s, a furniture leg, and tree limbs. 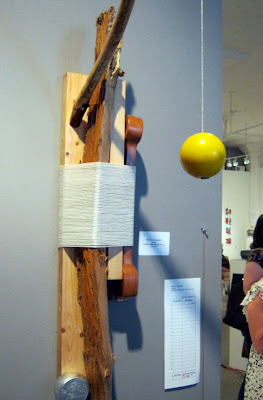 i also took a yellow ball that hangs in your garage to let you know when to stop your car ( i wouldn't have chosen this piece, but my 3 year-old was with me and he insisted). much of my work deals critically with issues of humans interaction with the natural world, and i often use found objects (www.markcowardin.com). i honestly struggled a little with this sculpture because i didn't want to make a piece about humans destroying/damaging nature. this is an event about nature overpowering humans. to me, the resulting wall mounted assemblage, is about remembering the impact of this event on real peoples lives. i live less than three hours from joplin, and my parents live less than 10 minutes from the epicenter of the tornado. my day to day life hasn't changed a bit, but i'm acutely aware that thousands of peoples lives in joplin won't return to normal for a long time. the wall mounted sculpture i completed for project reclamation is entitled "right here". i don't think describing the work would do it justice. 4. i am for an art that makes the viewer stick with an idea long after being entertained by the initial viewing.